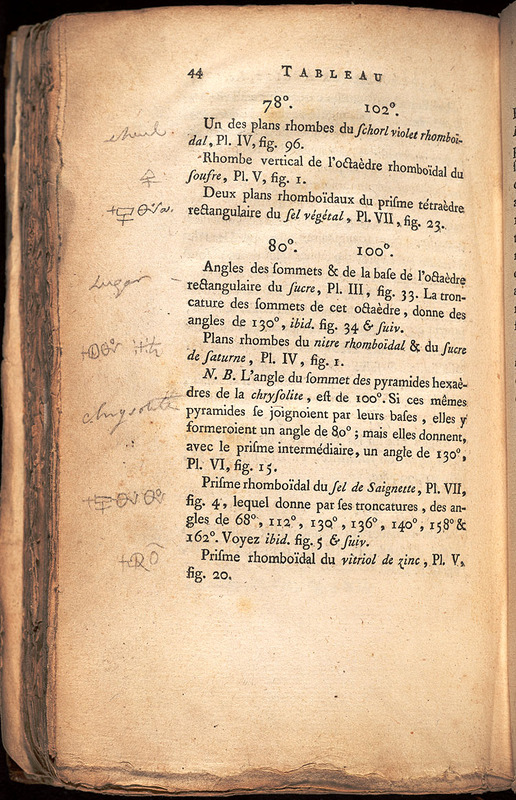 A page from “Cristallographie” from James Smithson’s personal library, with notes in his own hand. Huzzah! It’s National Library Week! April 12th-18th has been designated by the American Library Association as a special time to highlight the importance of libraries in America. While we like to think that every week is “library week”, we appreciate the opportunity to celebrate the amazing things that libraries do. We’ll be sharing some fun facts and quotes about libraries in our social media outlets this week – follow along with us using the hashtag #NLW15. Although we tell stories from the Smithsonian Libraries every day, in honor of National Library Week we thought we’d start from the beginning. Last week, we learned the background of the American Art and Portrait Gallery Library, just one of our 21 branches. The entire library system of the Smithsonian has a rich and complex history that goes back to James Smithson’s original gift. Along with $500,000, his bequest included his own personal library, now housed in our Joseph F. Cullman 3rd Library of Natural History. When the United States received Smithson’s gift in 1835, Congress debated how to use the money for almost another decade, with some senators arguing that the funds should be used to establish a national library. Eventually, the Smithsonian Institution was established in 1846 and it was determined that a site would be dedicated to “objects of natural history, including a geological and mineralogical cabinet; also a chemical laboratory, a library, a gallery of art, and the necessary lecture rooms”. The act also established the library of the Smithsonian as a copyright repository library, a duty it kept until 1858. Smithsonian Secretary Joseph Henry appointed Charles Coffin Jewett the first librarian of the Institution. 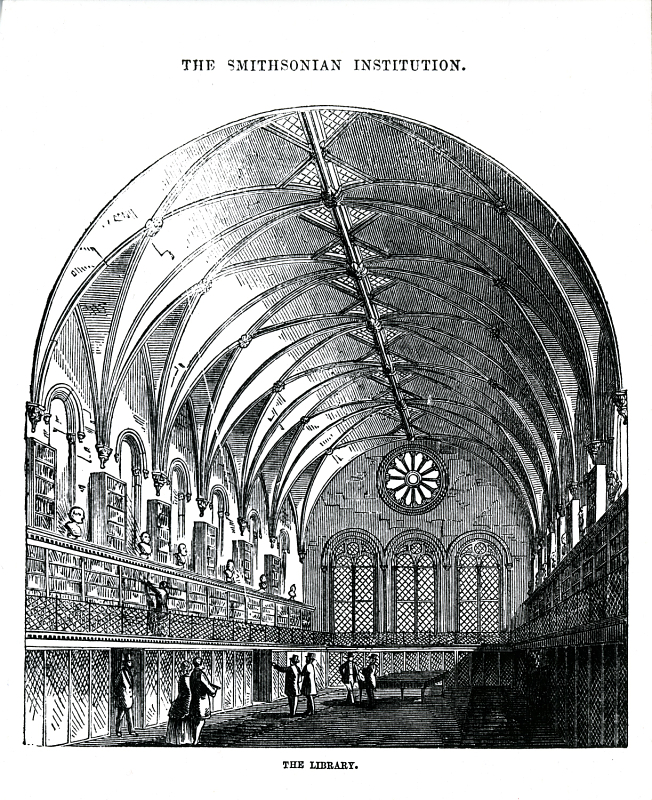 Print of an engraving of the library in the west end of the Smithsonian Institution Building, or “Castle.” The engraving was published in the Smithsonian Guidebook of 1857. Courtesy of Smithsonian Institution Archives. SIA2011-2392. Though it’s easy to imagine that our current collection of over two million items simply grew where it was planted in the Smithsonian Building (often referred to as the Smithsonian Castle), that’s not quite the case. After two fires in the 1860’s, Henry moved the collection, at that point 40,000 volumes, to the Library of Congress for safekeeping. 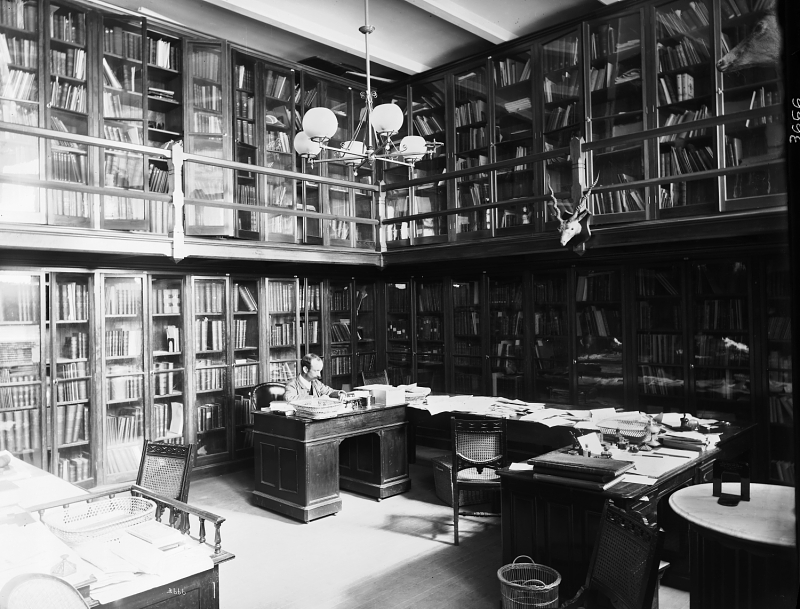 This was known as the “Smithsonian Deposit” and grew to more than half a million volumes that would eventually be integrated in to the Library of Congress’ collections. Although Smithsonian scholars still had access to this collection, the need for information at their fingertips was so great that scientists and researchers continued to collect books and keep them at the Institution. In the decades that followed, under Secretary Spencer Baird, a library was once again re-established at the Smithsonian. Baird donated his own personal collection as the basis for the library of the United States National Museum, which opened in 1881. Baird appointed F. W. True, a noted mammalogist, to oversee the collection. Library, later known as the Jewett Room, in the United States National Museum Building, now known as the Arts & Industries Building. Courtesy of the Smithsonian Institution Archives. MAH-3666. However, this single collection of books would not stand alone for long. Baird created 13 individual “working” libraries around the Institution, each operating independently and collecting items of interest to the curators and researchers using them. It was not until 1968 when Russell Shank was appointed as the first ever “Director of the Smithsonian Institution Libraries” that these collections were unified in to one branch system with central support services and a union catalog. 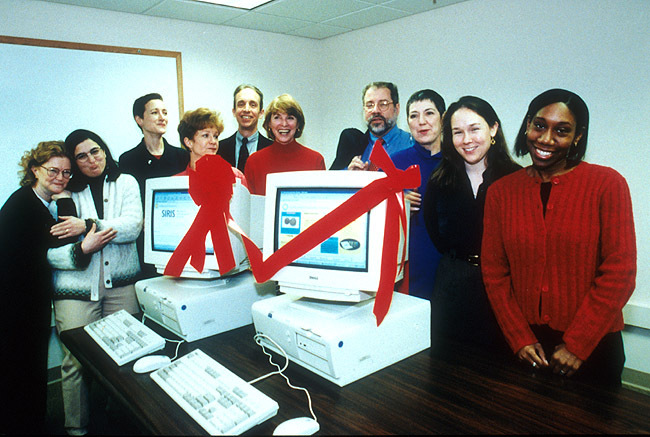 Staff celebrate the debut of the Smithsonian Institution Research Information System in 1999. While the publications in our collection are integral to the research of the Institution, the Libraries have grown to be much more than that. We continue to support Smithsonian curators and scientists by managing subscription databases and arranging interlibrary loans. We are also home to Smithsonian Research Online, the repository for the scholarly output of the Institution, as well as home to the secretariat of the Biodiversity Heritage Library, a consortium effort to digitize the collections of the world’s great natural history libraries. We like to think of ourselves as the heartbeat of the Institution – invigorating research by maintaining a steady flow of information. For a more comprehensive account of the history of the Libraries, please see our website for an article on the subject written by our director, Nancy E. Gwinn. The Smithsonian Institution Archives also has an information page about our history, as well and information about the origins of all of the museums and research centers around the Institution. Are you celebrating or participating in National Library Week in some way? If so, let us know in the comments below! Stacks in the Dibner Library for the History of Science and Technology. 2012.